For nearly 50 years, Mother Teresa endured what the church calls a “dark night of the soul” — a period of spiritual doubt, despair and loneliness that many of the great mystics experienced, her namesake St. Therese of Lisieux included. In Mother Teresa’s case, the dark night lasted most of her adult life — an almost unheard of trial. Tens of thousands of people are expected for the canonization ceremony Sunday for the tiny, stooped nun who was fast-tracked for sainthood just a year after she died in 1997. St. John Paul II, who was Mother Teresa’s greatest champion, beatified her before a crowd of 300,000 in St. Peter’s Square in 2003. Francis has made the canonization the high point of his Jubilee of Mercy, a yearlong emphasis on the church’s merciful side. 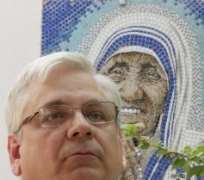 Francis has an obvious interest in highlighting Mother Teresa’s mercy-filled service to outcasts on the periphery, given that her life’s work exemplifies the priorities of his own pontificate. But Francis is also sending a more subtle message to the faithful through the canonization of the ethnic Albanian nun: That saints can be imperfect — they can suffer as Mother Teresa did and even feel unloved by God, said Ines Angeli Murzaku, a professor of church history at Seton Hall University in New Jersey and herself a native Albanian. That said, her blind faith in enduring the “darkness,” as she called it, and persevering through it seems almost superhuman to outsiders. Take the Feb. 28, 1957 letter she wrote the then-archbishop of Kolkata, Jesuit Archbishop Ferdinand Perier. Revelations that the smile was a mask to inner doubts about God’s presence fueled criticism of Mother Teresa — spearheaded most famously by the late Christopher Hitchens — that the Balkan nun was something of a fraud. “You can be joyful even if you’re suffering because you are accepting, and you are working and acting with love that gives meaning to the suffering,” he said in the courtyard of one of the Missionaries of Charity houses on the periphery of Rome. The revelations nevertheless shocked even Mother Teresa’s closest confidants and friends, the original sisters who joined her Missionaries of Charity after she was inspired to found the order in 1946. Kolodiejchuk said several sisters wept when he first read them her letters after he acquired them in 1998 from the archives of the Jesuits and archbishop in Kolkata. Sister Prema, the current superior general of the Missionaries of Charity, recalled being in awe of the revelation and not being able even today to fully understand the depth of Mother Teresa’s pain. Kolodiejchuk, the postulator for the cause, says that in retrospect, Mother Teresa’s “darkness” was actually a critical part of her vocation, kept hidden from the world that only saw a firm but loving mother superior who was the first in the chapel each morning and often worked herself to exhaustion at night tending to society’s most unloved.